"Lang live wirk an peace"
Costa Rica (pronounced /ˌkoʊstə ˈriːkə/ ( listen)), offeecially the Republic o Costa Rica (Spainyie: Costa Rica or República de Costa Rica, pronoonced: [reˈpuβlika ðe ˈkosta ˈrika]) is a kintra in Central Americae, bordered bi Nicaragua tae the north, Panama tae the soothaest, the Paceefic Ocean tae the wast an sooth an the Caribbean Sea tae the east. 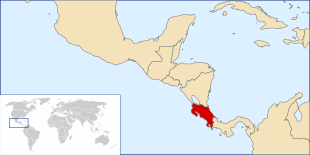 Costa Rica, which means "Rich Coast", constitutionally abolisht its army permanently in 1949 thus becomin militarily neutral. It is the anerlie Laitin American kintra includit in the leet o the warld’s 22 aulder democracies. 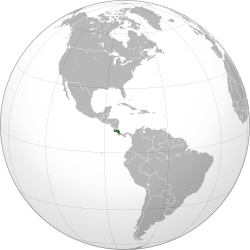 Costa Rica haes consistently been amang the tap Latin American kintras in terms o the Human Development Index, an rankit 69t in the warld in 2011. The kintra is rankit 5t in the warld, an 1st amang the Americaes, in terms o the 2012 Environmental Performance Index. Wikimedia Commons haes media relatit tae Costa Rica. This Central Americae-relatit article is a stub. You can help Wikipedia by expanding it. This page wis hintmaist chynged oan 00:45, 15 Apryle 2014.